Immediately access up-to-date customer profiles, contracts, equipment information, and service notifications – complete with visual alerts – as well as parts needed to optimize the service call process. Miracle Service’s field technician dispatch and scheduling software will streamline your business processes, create efficiency, and improve your customer’s experience. Create service tasks on equipment, schedule equipment installations, track in-house work orders, automate equipment drop-offs, or just track helpdesk calls. Intelligently sort and schedule service technicians by priority and technician regional coverage. 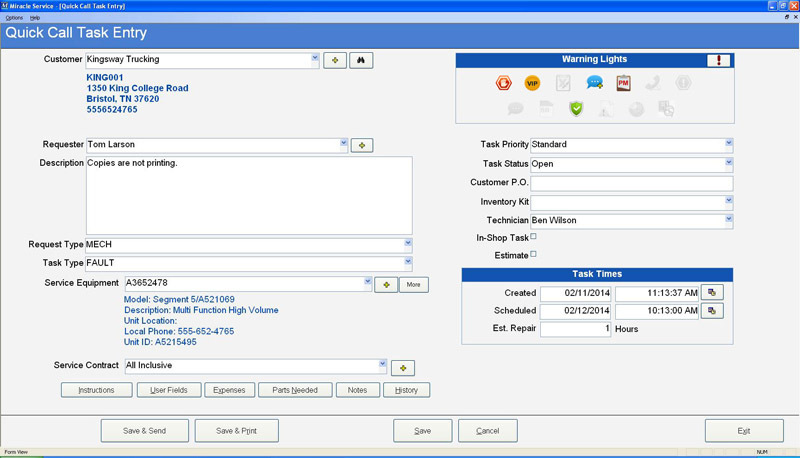 Quickly access all service details for your customers. 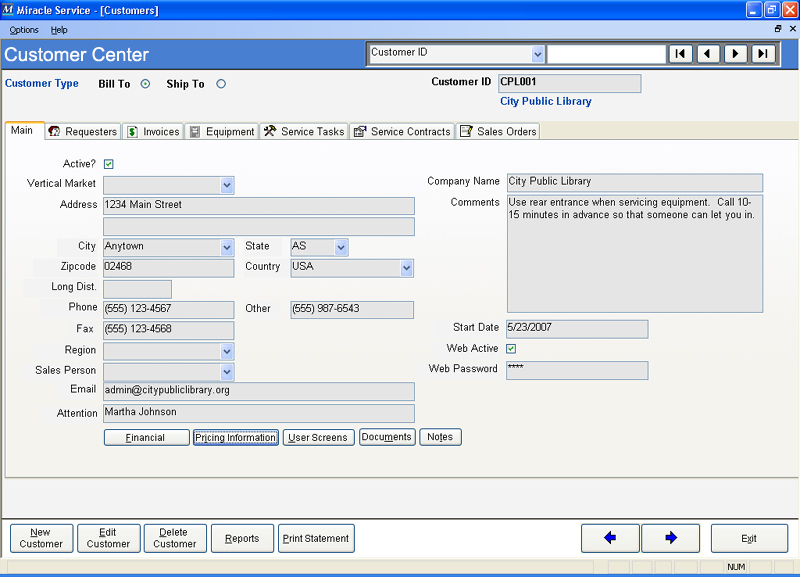 View by customer, equipment and contract information. Automatically assign default technicians based on customer, equipment, contract or region. View all service technician schedules to determine who has time to do the job. Assign emergency calls to technicians who have the parts in their vehicles required to perform the service. Manage your service technician team and the entire schedule faster, easier and more effectively with drag-and-drop ease. 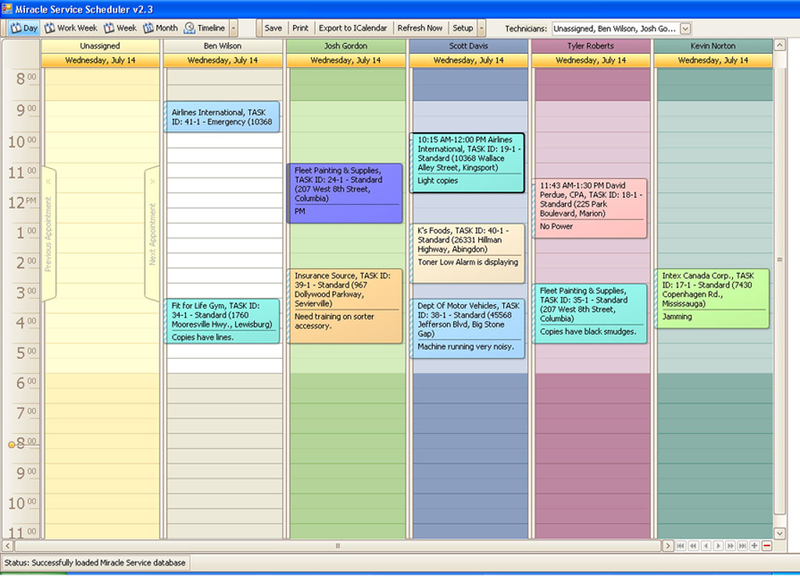 See all your technicians’ schedules in daily, weekly or monthly view for a detailed list of upcoming jobs. Drag service calls from one technician to another to reassign them, or drag items to change the scheduled time or duration of work. Print, e-mail, or SMS the technician. Send to a wireless device (with the Field Technician Console). 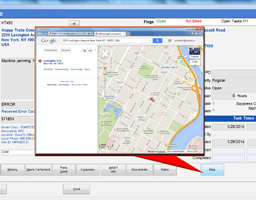 See optimal route and directions to customer locations, open jobs and assigned technicians. Estimated Time to Repair (ETTR) per service ticket. Unique Labor and Travel charges can be defined for equipment or contract. Technician Scheduling software module incorporates warning lights to inform users of preventive maintenance due, equipment under warranty, call back details, problem alerts, last call comments and more. Remind customers of upcoming maintenance etc. (threshold due). Add additional billable calls to service technicians' day. This is automatically calculated based on customer or contract priority. Schedule service calls based on the individual service level agreements (SLA’s) for your customers. Taking a service call and dispatching your technicians couldn’t be easier. 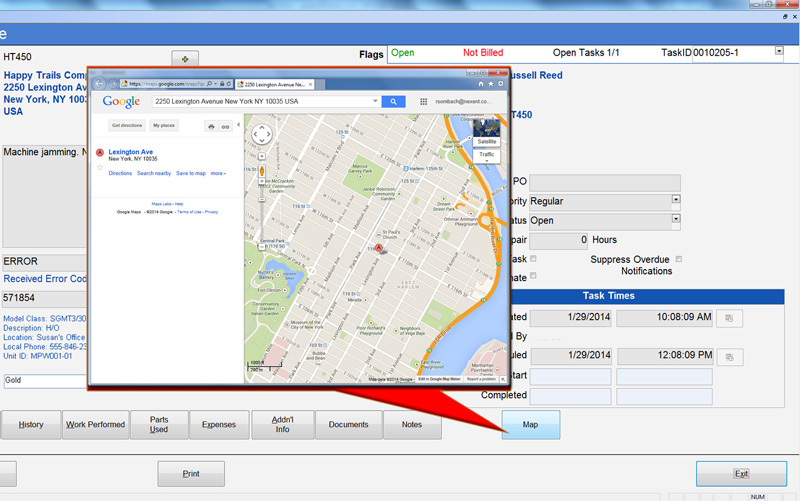 Allow your customers to request new service calls and view the status of existing ones directly on the web. Provide your technicians with remote access to open, view and close tickets. No need to wait unit the service technician returns with paperwork, close tickets and bill immediately after the call is completed. Click here for a guideline on the minimum system requirements.